Bruno has a vast experience and knowledge in the flooring industry. 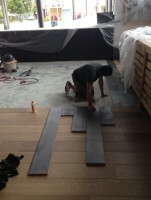 He started laying floors when he was 20 years old for a very known flooring company in Miami. Then he started his own business at the age of 23. Then he went to College to persuade his passion for knowledge graduating from Broward College in AA with a Civil Engineering mayor, then he transferred to FAU. He has attend many courser in the wood and concrete flooring industry. He was able to put all this knowledge into Bruno Bomffim Floors Inc to provide the best service and experience to its unique and valuable costumers. We also offer a various range of extra services. Such as custom made stairs, and installation on doors, casings, base boards, crown molding, custom made flooring moldings, marble floors, tile floors, laminate floors, and much more. You can also take advantage of our dustless sanding and finish system. We also take advantages of using the best finishes the market has to offer. We are specialized in all types of wood flooring installations. We are always updated with the south Florida counties installations requirements, and laws of installation.